My love of hexagons continues. Seems like odd colors right? A friend of mine sent a note with a cute graphic that inspired me. The card was from Wit and Whistle. Isn’t it adorable? 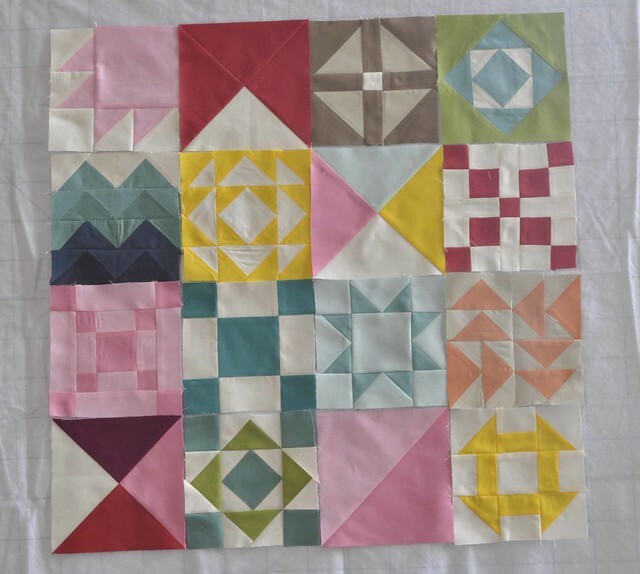 I grabbed my accuquilt and proceeded to cut hexies. The die has three different sizes, so I could play with various colors and sizes. I sewed all of these together by machine. It was soo much fun. hexies as layers on top. 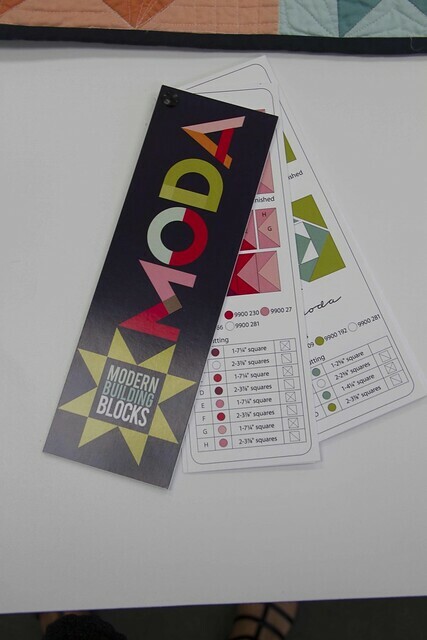 At moda we initiated a staff challenge. We were designing some basic 12 pack patterns using Bella solids. These patterns were designed as”blueprints”. No color, just let your imagination decide. To test the process, several of the office staff jumped in to take the color challenge. 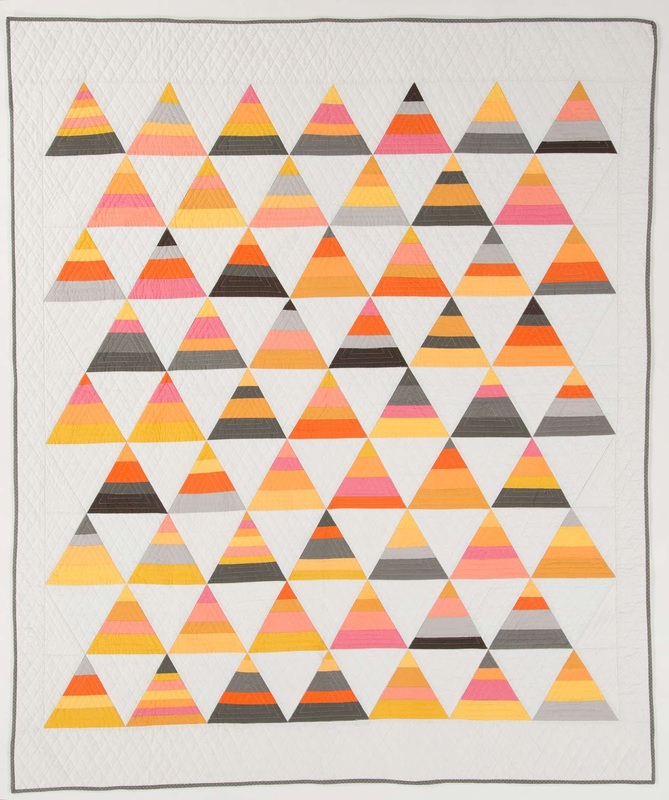 I choose Peaks as my quilt pattern. 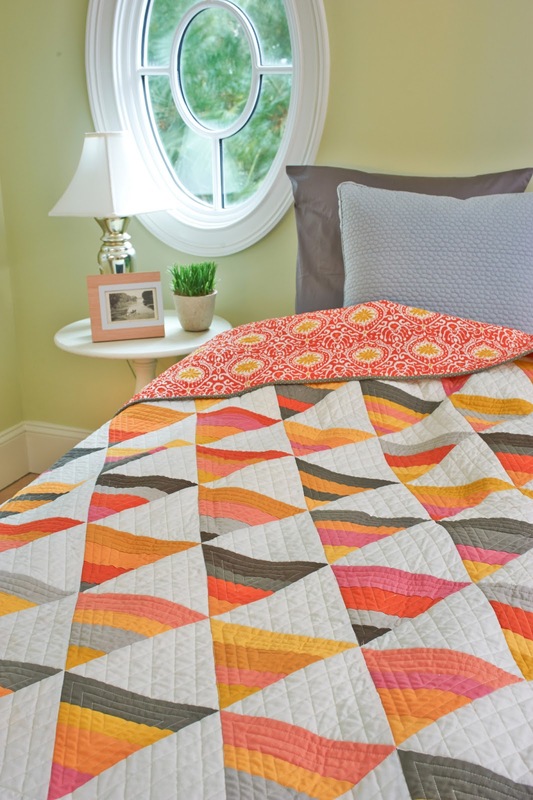 It was selected to be featured in the current issue of QUILT, April/May 2013. They called it Candy Corn because that is exactly what it looks like. Working with all solids is not just for the Amish. However, it was a bit of a challenge for me. I learned to quilt in the days of muslin backgrounds and little tiny brown calicos. I was taught solids were not forgiving. so stay clear of solids.” This is the same teacher that wouldn’t let me use plaids. Thank goodness time has changed and we have so many more fabric options. 30 years later and we probably have too many options. Pick your absolutely favorite fabric with TONS of colors. Choose your absolutely fav fabric. Pick solids that match the print. Remove the print fabric and you will have the perfect combination of solids. You will need 12 fat quarters and a background. Add a punch of color by using your colorful print as the back. I used a Zen Chic grey pindot as my binding. It was a bit unexpected. I love it! 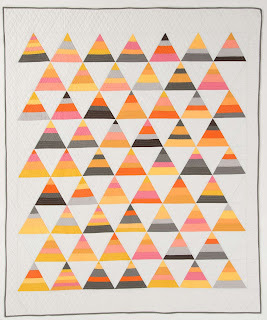 didn’t mean for the quilt to look like candy corn. This design would make adorable Christmas trees also. 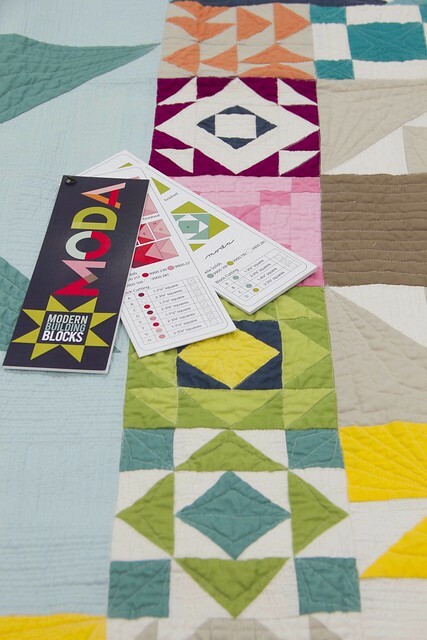 Ask at your favorite store to see if they are offering 12 pack quilt projects. Thanks, Maggi Honeyman for the quilting. You’re the greatest! It must be that time in my life. Everyone around me is having babies or grand babies. (Don’t get any idea, kids) My niece and nephew, Daniel & Emily Tardy are due to have her first child (we know it is a girl) next week. Their nursery has a light fabric with a wonderful big paisley full of greens and blues. I didn’t have any of the fabric to be able to match a quilt to, yet I trudged on. 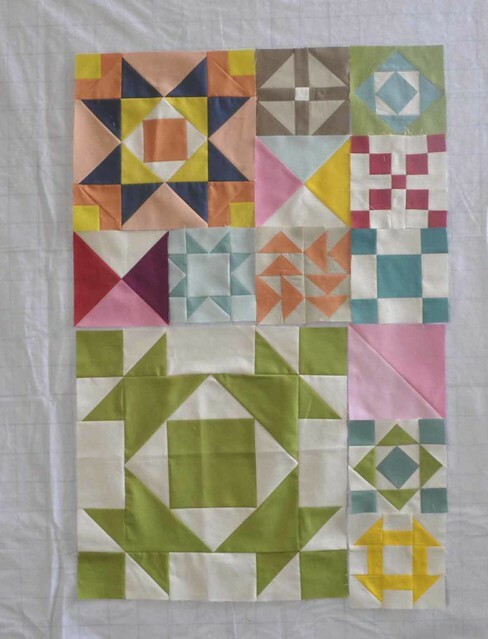 I love the Denyse Schmidt style of quilts, so I thought I would sew some wacky log cabin or something nice and graphic. Changed my mind mid stream. At market, Quiltsmart had a pattern to make an orange peel and I thought this design would be perfect. Viola! Easy, easy. easy and fun! With quiltsmart the templates are printed on lightweight fusible interfacing. 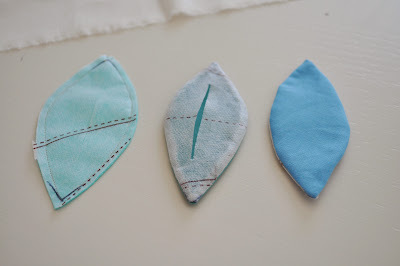 First cut the interfacing, sew them to the fabric pieces and turn like a pillow. The exposed side of the interfacing is fusible so no or little pinning is required. Iron it in place and sew it down with whatever method you prefer. 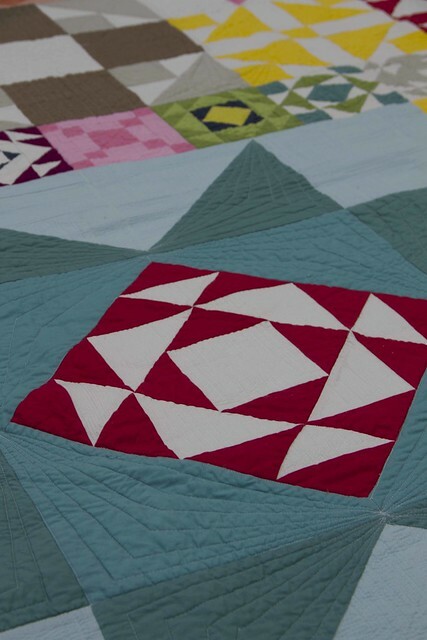 You can leave the interfacing in or cut it out from the back side of the quilt. Viola! Viola! You may notice the petal shapes above have printed lines across the middle. 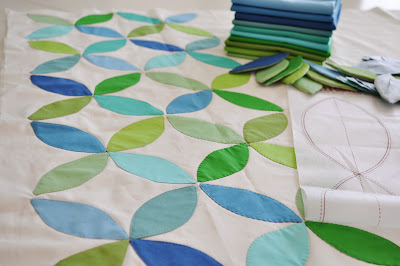 For my baby quilt I wanted smaller petals than the quiltsmart interfacing featured. I reduced the shape 50% and traced it on to the interfacing. 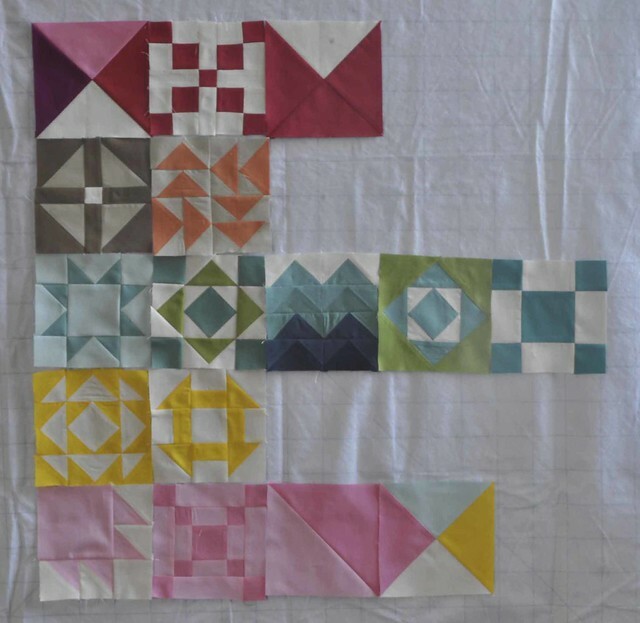 I only used a little bit of the interfacing for this project, so I will have plenty left to also make this quilt full size using scrappy prints. 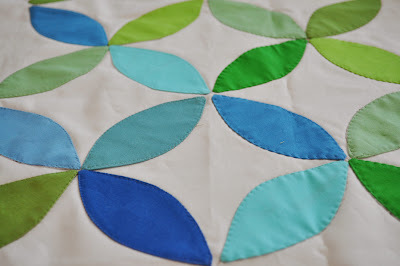 Normally, you would sew these petals on to squares and then assemble the blocks. I didn’t want all the petals to line up (intentionally or not! ?) so I am appliqueing the petals on the background as a whole piece. I have (name goes here) Tardy, Feb (date) 2009 ready to applique as soon as I hear the news. Quilt it and ship it!! Savannah Lynn Tardy has been born. I’ve got to get to work on the borders.